A spokesman for more than 50 small-scale or “craft” breweries in Iowa is warning the proposed merger of the world’s two largest beer companies could endanger the craft beer industry. “As the craft brewing industry continues to represent true job and sales growth in an otherwise flat sector, craft breweries may encounter problems if this acquisition proceeds,” says J. Wilson of Prescott, who was hired last year to be the coordinator for the Iowa Brewers Guild. 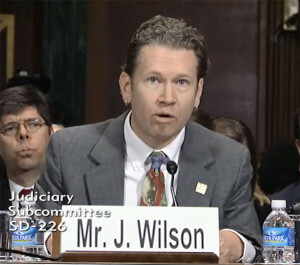 Wilson is in Washington, D.C. today, testifying at a U.S. Senate hearing examining the merger between Anheuser-Busch InBev — the maker of Budweiser — and SABMiller. “If this deal is allowed to proceed, growing craft breweries in Iowa and elsewhere fear difficulty with access to both market and raw materials,” Wilson said during a Senate subcommittee hearing. Craft beer now accounts for 11 percent of total beer sales, but Wilson warned Anheuser-Busch has great influence in the distribution chain and could try to squeeze out that competition. “With deep pockets already allowing ABI to hold sway over many wholesalers on marketing incentives, the amount of influence a combined company of this magnitude would have over market access is startling,” Wilson said. Anheuser-Busch has purchased 12 independent distribtors in nine states since 2012. Wilson said Busch family members own five other distributorships. Wilson is urging federal officials to force Anheuser-Busch to sell off the wholesale distributorships and examine how the merger would impact the supply of raw materials. If the two beer companies are allowed to merge, the new company would control a third of the world’s beer supply, including brands like Corona, Stella Artois, Grolsch as well as Budweiser. Anheuser-Busch is already the leading beer company in the U.S., Mexico and Brazil. By acquiring SABMiller, it will grow its market share in Latin America and Africa at a time when the tastes of U.S. consumers are shifting to craft beers and cocktails.